Randy Lee Merkin, age 65, passed away on Friday, February 24th, 2017. Randy’s gregarious and fun-loving personality touched the lives of many people. 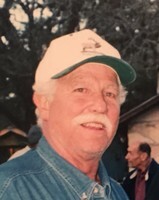 He loved his family, his grandchildren, his deer, fishing and working on the ranch. Everyone that knew him knows that he loved others unconditionally, and never asked anyone to change. He was always authentic. He loved bringing a smile to his loved ones’ faces. He accepted everyone for who they were. He was an incredible shot with lightning fast hands, an aggressive baseball catcher as a youngster, an avid hunter, a fisherman, a good golfer, and a best friend to many. Randy was born on March 20, 1951, in San Antonio, TX. He was known by many in the commercial construction community where he worked for many years. He spent the last 15 years of his life living in Wimberley and working at King Feed and Hardware. He was preceded in death by his father whom he dearly loved, Bryan Merkin, Jr. and his mother, Ellen Paschal Merkin. He is survived by his wife of nearly 45 years, Carol Sue Merkin; his four children, Heather Carol Merkin; Mindy Sue and husband Todd Warner; Timothy Bryan Merkin and wife Stacy; and Seth Benjamin Merkin and wife Andrea. He also is survived by his brother, Larry Bryan Merkin, and sister, Pam Merkin Toifl. He leaves 11 grandchildren that affectionately knew him as “Papa”: Annabelle and Kelsi Pence; Ellie, Halie and Clayton Warner; Libby, Cece, William, and Millie Merkin; and Halle and Kate Merkin. A memorial service will be held at 3 pm at the Wimberley VFW Hall, 401 Jacobs Well Road, Wimberley, TX 78676 on Sunday, March 5th, 2017 followed by a reception. Randy loved children and hunting and had a heart to share that passion with others, so to honor him and in lieu of flowers, please make a donation to Buckmasters American Deer Foundation’s Disabled Hunters Services (buckmasters.com/Resources/disabled-hunters/memorial-donations). Please mail donations on behalf of Randy Merkin to BADF Memorial Donations, 10540 Daystar Drive, Tuscaloosa, AL 35405. Randy was one of the Macsters with whom I did not have any classes but I got to know him as the friend of a friend--by the "transitive property of friendship". I heard stories about how Randy, Terry Maxfield, Joe Graham, and others would "go to the ranch" and do all the things that teenage boys and later college guys do. I spent an annual weekend in Wimberley for years with some Houston friends before I made my first trip to the Merkin Ranch. I understand now why Randy and his family love that part of Texas. I even made it to a couple of the Annual Merkin Ranch Parties! He was blessed with a wonderful wife in Carol Sue, four great children and a herd of grandchildren. What more could one ask for? He will be missed. I am so sad to hear of the passing of Randy, a more generous soul could not be found. My heartfelt wishes go out to his family, and if there is anything that you need, please contact me, and I will help in anyway possible. This is a loss that will never be replaced. and I truly respected and cherished this great man. I was blessed to call Randy my friend for over 50 years. From pellet guns in the 7th grade hunting Canyon Creek, to being roommates at UT, we made a lot of wonderful memories together! He had a smile that came from his heart, and his friendship was unconditional. He was a prankster and full of life. That is why he got so much out of life, he did not sit around and be bored or indifferent. He preferred to actively pursue joy at all times. Whether that meant to sleep overnight with a pregnant horse, or to push on the gas pedal of his Torino! Randy's dad Brian Merkin was a warm and giving soul, also with a smile that came from his heart. When Randy and Carol had kids, I saw Randy quickly evolve into the fatherly loving man imprinted from Bryan. This new fatherly evolution for Randy did not diminish his love of life, and in fact in some ways this new role gave him more opportunities to show his true crazy self with a smile to his wonderful kids, and they loved it!! Randy's love of life, plus Carol's life of love, resulted in four amazingly beautiful children!! While Randy was their hero, they are his heros!! He loved Carol, Heather, Mindy, Tim, and Seth to the moon and back! PS: As I was leaving the memorial service, Randy's little blonde headed grandson was wedged between two little bushes just outside the front door of the hall, taking a pee! A chip off the old block! I first knew Randy during our later years at Mac. He shared his family ranch with me and I shared my family's water ski boat with him. We had lots of fun together - not surprisingly, mostly during hunting season and summers. I once arrived at his house in Hollywood Park with a flat tire. After spending about 15 minutes locating the spare, and staring at the jack, his sister Pam, realized that I was going to need some help, so she asked Randy for immediate assistance. He changed my flat in 5 minutes while casually telling me a funny story about some past decision making of his that resulted in creating some flat tires. One of the fruits of the Spirit is kindness. Later on while we were both attending UT, I was driving this little piece of crap 4-cylinder Ford Capris. I had to often jump start my 2 good cylinders with jumper cables, as my alternator was failing and not properly recharging the battery. Well, Randy said he could fix the mess. So I drove over to Randy's somewhere off Airport Blvd in Austin late one night. For about 3 hours I watched Randy become a genuine auto mechanic as he rebuilt my alternator under the light of a hanging work light, soldering every color wire imaginable to a series of metal plates. He never once needed my usual "fix-it-up" tool, a heavy hammer. We (he) finished up around midnight. Another fruit of the Spirit is patience, and another self-control. I will never forget Randy's smile. I could still see it from the end of our 75 foot long ski rope while he was pulling me and Bill Barnhill down the long, "smooth-as-glass" river section of Lake McQueeney while we were double bare-footing as he grinned from ear to ear looking back at us. He would tell me that story every time I saw him. His most defining fruit of the Spirit was the gift of joy. I think something is in my eyes, they are tearing up, so I will close now. I will miss him dearly. P.S. As I was leaving the memorial service, I looked around and wondered if there were any deer still left around here or did they all end up posing in that slideshow. For my own personal reasons, I've let much of my high school memories fade away. But one of my favorites, that I'll always hold onto, was with Randy. He and I dated briefly in high school, but the 'romance' didn't last long as we were always just good friends. But during this brief time, we had a running joke that one day I'd shine those scruffy boots of his! One day he decided to let me do just that. He came to visit and brought those boots with him. I watched through the window as he walked to my front door, smiling that big 'Randy' smile. My two older brothers saw him too and asked me why he was carrying his boots. I tried to quickly explain as he approached our front door ....and they didn't like it one bit that he was bringing his boots for me to shine! I'll never forget that look of surprise on his face as my brothers opened that door, staring him down. But Randy never stopped smiling. RIP my friend! Click here to see Randy's last Profile entry.